It was a little more than a month ago in March, during some wet weather and a lull in my job-hunting schedule, that I thought I’d embark on a C-band satellite hunt. No, I’m not shooting down satellites … it’s just my term for scanning the skies. After all, I had moved back to the house where I had installed a 2.3m mesh C-band dish seven years ago and finally got myself unpacked to the stage of being functional again. For the most part, in the intervening years, this dish pointed at ChinaSat 6B with only one phase of scanning the skies around 2013 (that I didn’t report on). Back then, I had a limited set of equipment, relying on my TBS 6925 and Crazyscan to lock onto DVB-S/S2 signals. As a result, I missed quite a few satellites as I just couldn’t find them in the sky. Getting an accurate aim with a relatively primitive “beeper” style satellite finder on those lesser-used satellites can be absolutely impossible for a beginner. Now that I was equipped with a Tektronix RSA306 spectrum analyzer and a lot more experience it would be good to do it again. In-between, I was playing with Ku equipment since it’s more manageable in a small backyard at the other house, so satellite hunting has become something I’ve become experienced at, but using an RTL-SDR is hardly optimal. Even more unfortunate was the declining health of my favourite TBS 6925 satellite tuners, leaving me without any reliable way of detecting, locking and analyzing 16APSK/32APSK transmissions, or even those using Adaptive Coding and Modulation / Variable Coding and Modulation (ACM/VCM) or Multiple Input Stream (MIS) / Generic Stream formats. But I don’t let a few minor challenges stop me from a satellite hunt. 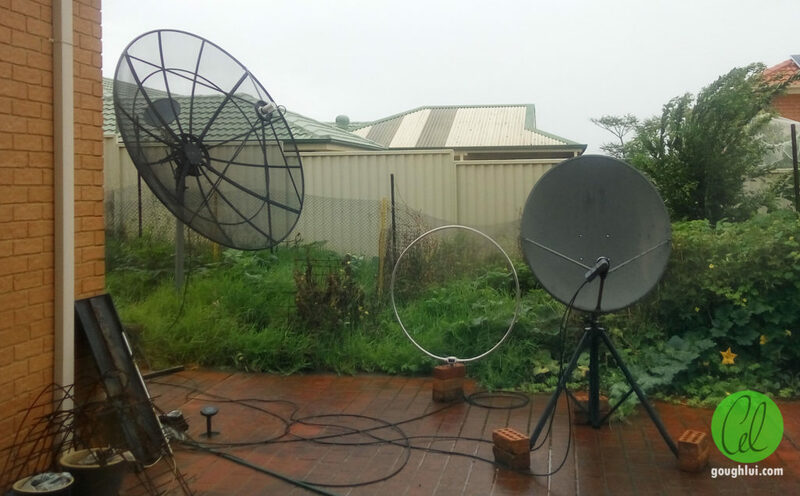 After all, direct-to-home satellite seems to be a shrinking market in Australia and the cheap mesh dish probably doesn’t have much life left. Unfortunately, this also means getting a new dish isn’t easy or cheap either, so I might as well make the most of what’s left as my Dad no longer watches satellite – complaining of the low quality of satellite and the improved convenience of video-on-demand through the internet. C-band satellite involves microwave signals beamed down to receivers in the 3400-4200Mhz band (downlink). This band has been used for this purpose since the early days of satellite television, originally termed Television Receive-Only (TVRO) when such C-band transmissions were used (primarily) to network studios and transmission facilities. Originally, transmissions were analogue and in-the-clear which limited the amount of programming on each satellite. Schemes to reduce analog bandwidth use and introduce conditional access scrambling were employed, such as D2-MAC. This was later followed by digital broadcasting in the late 90’s (DVB-S) allowing multiple-channel-per-carrier operation (MCPC) and digital conditional access (DVB-CSA). At the present time, DVB-S2 has gained significant popularity as a more-efficient mode compared to DVB-S, and DVB-S2X has also been proposed for professional uses. It’s not uncommon to find satellites carrying hundreds of television programs. C-band’s strength is in its use for wide-area coverage. Many C-band satellites have transmission footprints that cover wide areas as opposed to the narrow “focused” beams that most Ku-band satellites have. Another big advantage, especially in tropical areas, is that the lower frequency is less affected by rain fade, improving communication reliability. However, as with all microwave-based communications with geostationary satellites, sun-outages will be a problem. Because of the lower frequency of C-band (as compared to Ku-band which operates at 10700 – 12750Mhz), larger dishes are required to receive the signal and achieve similar signal gain. On the upside, the dishes do not have to be as dimensionally perfect and can be made of mesh to economize on weight and reduce wind loading. Commonly, mesh dishes of 2m to 3.7m are used for digital direct-to-home reception, making it more laborious to install compared to Ku-band systems. This is where the “Big Ugly Dish” (BUD) nickname comes from. Where modern apartment-style housing is concerned, there may not be enough space or sky-access for C-band satellite reception – I’ve seen some resort to receiving only some strong carriers with a 1.5m solid-panel “mini BUD” dish or converted Ku-band dish using a conical scalar ring. Unlike Ku-band dishes, most C-band dishes are prime focus type. The signal from the satellite is reflected by the dish to a focal point, where an low-noise block downconverter (LNB) receives the signal and converts it down to an Intermediate Frequency (IF) for transmission down a coaxial cable to a receiver. A traditional “wideband” C-band LNB has a single local oscillator (L.O.) of 5150Mhz which is multiplied with the received signal of the satellite and filtered to produce the downconverted signal between 950Mhz and 1750Mhz. Because the L.O. is above the input frequency, an inversion occurs in the spectrum – so a signal appearing at 4200Mhz input is translated down to 950Mhz, and one that arrives at 3400Mhz is translated down to 1750Mhz. Further to this, satellites also employ frequency re-use through using two different transmission polarities. For linearized transponders, the two polarities are Horizontal and Vertical. The signal can be thought of as being emitted in these two different directions, being picked up by matching antenna probes in the LNB which are sensitive to just a single polarity. This allows the same frequency to be used twice – one signal on the horizontal and one on the vertical should not severely interfere with each other (in ideal circumstances). In practice, this depends on a few factors – cross-polar rejection of the LNB design, the atmospheric conditions (as it can cause depolarization) and the skew adjustment accuracy. Skew is adjusted by rotating the LNB in the holder, and is necessary for linear transmission due to the relative orientation of the satellite versus the dish. For circularly polarized transponders, the corresponding polarities are left-hand circularly polarized (LHCP) and right-hand circularly polarized (RHCP). Using a regular linear-type LNB, a dielectric plate or block which looks like a thick fibreglass PCB substrate needs to be inserted into the slots in the front of the LNB feed to convert the circular polarized signals to linear polarity. This comes at a cost of signal strength, but has the advantage that skew adjustment is unnecessary. When it comes to receiving geostationary satellites, they all reside in (or close to, in the case of inclined satellites) the Clarke belt. Following the belt across the sky allows you to “hunt” satellites. In the case of more sophisticated set-ups using polar-tracking mounts, this could be as simple as swinging the dish using a linear actuator from the comfort of your armchair (assuming it’s been installed correctly and working). In my case, it means manually going outside with a wrench, undoing a few bolts and swinging the dish around while adjusting the skew. While satellite hunting, there’s a few things to be mindful of. Towards the horizon, satellites at low elevation are especially problematic due to atmospheric effects, terrestrial radio interference and physical shadowing by objects such as buildings or trees. While actually aligned to a satellite, the signals received could be interfered with by terrestrial radio waves but also satellites in adjacent slots as the beamwidth of most dishes is about 2-3 degrees (at half-power), so it’s likely that you could see some interference where satellites are closely spaced. In some orbital slots, the space is shared by two satellites which transmit in separate part of the bands. Originally, when I configured the dish, I used the most popular type of C-band LNB at the time, known as a One-Cable Solution (OCS) or Band-Stack LNB. This type of LNB (illustrated bottom) has two local oscillators – 5150Mhz and 5750Mhz, allowing both horizontal and vertical polarity to be simultaneously received and piped down the same cable. This has an advantage that simple splitters and power injectors can be used to distribute the signal to multiple satellite receivers to allow them to watch different programs simultaneously from a single LNB output. The downside of OCS LNBs is that they only receive from 3700-4200Mhz. Signals outside this range in the extended C-band cannot be received! For proper satellite hunting, a “regular” wideband LNB is recommended – this uses only a single 5150Mhz L.O. and instead relies on the traditional 13/18V switching to receive each polarity in sequence (illustrated middle). This is particularly important if we want to look at satellite beacons and slightly out-of-band transmissions. Unfortunately, while these were the “normal” type, locally it seems to be quite rare to find. The downside of the wideband LNB is that they are sensitive to interference. Previously, one major offender was the Unwired Navini WiMAX system. Ideally, if you have access to a more sophisticated phase-locked loop (PLL) LNB, this could be an advantage as the frequency stability will be better than a traditional dielectric resonator-oscillator (DRO) LNB which drifts wildly with changes in temperature. This is especially advantageous for narrow carriers to ensure receivers can lock and track the carriers accurately. Sadly, I don’t have one of these (they’re not exactly cheap either). Curiosity – I’ve never been able to hit every satellite I know of from online listings such as Lyngsat or Satbeams. Even though a lot of satellites won’t have footprints covering Sydney, Australia, I can’t say I’ve received all of those which claim to. Not knowing why I missed them in the past is a point of frustration I hope to resolve with better gear and technique. Contributing – Online listings such as Lyngsat and Satbeams tend to concern themselves with TV service listings, but often rely on voluntary contributions to keep them up to date. Without people actively checking out what’s on the air, those listings can get “stale” and miss new services coming online and old services dropping off. Completeness – The online listings are almost all focused on TV services, but satellites carry a lot more than just DVB. What about the services that can’t be locked by DVB cards? Is anyone still running analogue? Are there any satellites we don’t know about? Entertainment – If you have a dish, you’d hope that there’s something to watch. So by sampling the satellites, I’ll have a better idea of what is available and might catch a few feeds or sample transmissions. Identification – While satellites have footprints that are concerned with their broadcasts, they also transmit different types of beacons used to identify the satellite, control uplink powers and relay telemetry/health data. The data about these beacons seems to be rarely shared (maybe with the exception of Optus). What do the C-band satellite beacons look like? What are their frequencies/spacings? Are the beacons receivable outside of the broadcast footprint for recovery purposes (e.g. omni antenna)? Testing – If you have the equipment, I think it’s a good excuse to try it out and sharpen your skills. One side effect of actually writing posts about the data I collect is that it forces me to look at the data and analyze it, rather than leaving it to sit around. It also means that I end up tabulating it in a way which makes it somewhat more useful when I come back to revisit it. Knowing this, I don’t expect to find great SNR to the point of locking 16/32APSK signals which isn’t that big of an issue since the Prof can’t do them anyway. But I’m already quite marginal especially on some of the satellites near the horizon, so we’ll see how far I can get. The DRO LNB won’t help, as it means determining exact beacon frequencies is impossible – but the spacing between beacons should be relatively accurate. Maybe we can compensate for this by finding the offset between known carrier frequencies and actual received frequency (assuming the LNB temperature didn’t change much). Dish alignment was tweaked with occasional reference to Dishpointer, although it was often easier to get onto just one satellite on the belt, change the elevation until it fades out, then swing the dish slightly to hit its neighbour satellite, then readjust to peak to “walk” along the belt. To do this, I used the Tektronix RSA306 on one machine, and accessed the screen via VNC on a smartphone from the backyard next to the dish to see a real-time read-out of the spectrum. In this post, I covered some of the basics about C-band satellites and satellite hunting. I also went through some of my motivations for doing this, what I used and how I’m going about it. It’s a bit of a shame that it seems that satellite direct-to-home seems to be declining in popularity, so I fear that being able to obtain and use satellite equipment is going to be more costly and difficult in the future (as it already is). It seems IPTV and VoD over the internet is just too convenient by comparison and the satellite “squeeze” to shove more variety into a limited bandwidth has destroyed quality in a similar way it affected terrestrial DVB broadcasts. In the following series of posts, I’ll report on the large amount of results obtained in a “group” of satellites at a time.